It's not that often that I get depressed with the weather in Phuket. During the "rainy season" you get rain, sure. You can get rain in the high season too, rain does not bother me, as we normally get short, hard tropical downpours and then it's sunny again. 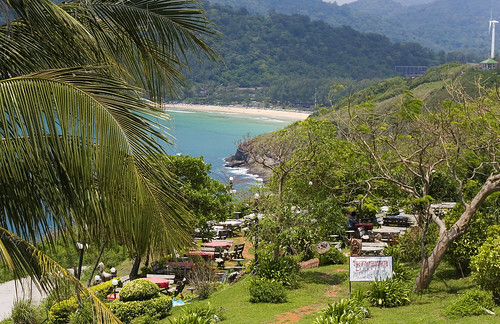 Occasionally you get periods of a few days with hardly a glimpse of sun, but I have written before that the low season is generally a nice time to visit Phuket if your plans are flexible and you are not counting on sunning yourself on the beach. My parents have visited from England many times and normally in the low season. They were here in October 2010 and weather was OK, they have been in July with mostly good weather.. but this time, it really has been wet. We already changed plans due to a few wet days at the end of September, but things seemed to be getting better. The last blog update on 2nd October was positive - Sunday 2nd had been a hot sunny day and we'd been out in Phuket town for a vegetarian festival procession. We planned a trip to Khao Sok National Park for the next few days, but heard a weather warning on the Thai TV and the forecast did look wet and windy. I hate to change plans, but since Khao Sok was likely to be wetter than Phuket, we decided not to go. Good plan! The night of 2nd October was VERY Wet and so was most of the 3rd. A stay at home kind of day. Never mind, we thought.. won't last more than a day or 2. (above) Rainy day at home, 3rd October. It did clear in the evening, enough for us to take a walk at the nearby Bang Wad reservoir and we decided to check out an evening event at Sam Kong shrine in the north of Phuket Town - something called "Bladed Ladder Climbing", part of the Phuket Vegetarian Festival. 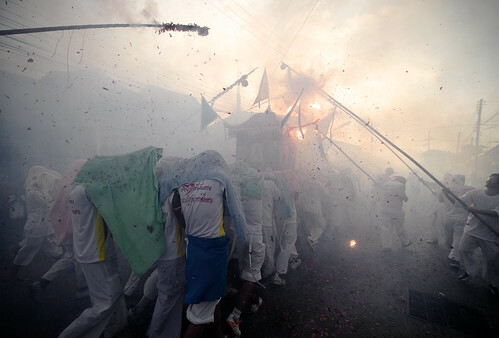 I did not take a camera along, but it was less crowded than I thought it would be - will go again next year. October 4th - started dry, sky cleared, and it was hot already at about 7am. Yes, we were up that early - earlier in fact ... We went to Kathu shrine just after 6am for the start of their Vegetarian Festival street procession. 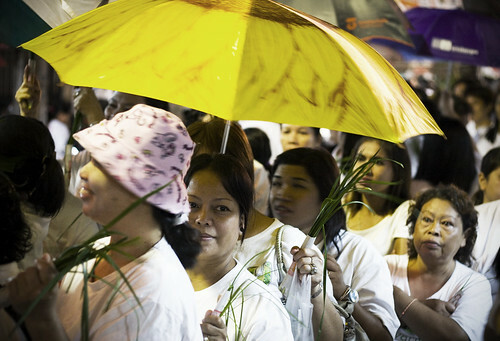 The sun was rising as the Ma Song got pierced in the shrine and as the procession left Kathu for the walk to Phuket Town. Well worth getting up early sometimes! BUT whadaya know... not long afterwards, the rain started up again. We did not head into Phuket Town, were home by about 7:30am. And it turned into a very wet day. 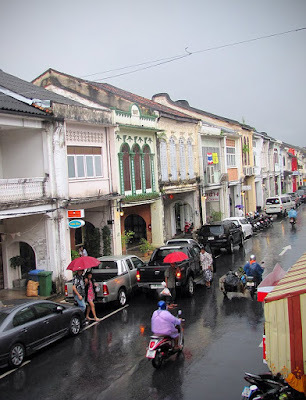 We did head into old Phuket Town for lunch.. in the rain.. dodging under the archways on Thalang Road, darting out into the rain before landing at the Kopitiam restaurant for tasty vegetarian food. Even on a wet day you can wander in the old town, just take an umbrella! Thought about doing our Khao Sok trip on the 5th, having had 250mm of rain in the previous 3 days.. but the rain continued into a 4th wet day. Some minor floods here and there in Phuket though I did not see any myself. Certainly flooding in some parts of Thailand, especially the north. A friend in Khao Lak said it was wetter than Phuket, so we decided again to forget Khao Sok. A mostly hiding-from-the-rain day, except in the evening, despite a light drizzle falling we headed to Kathu village for a ceremony called "Bridge Crossing for Purification". Basically the whole population was there, dressed in white, queuing for a quarter mile to enter the shrine and cross a ceremonial wooden bridge and be blessed by the Ma Song. The last 2 days have been almost dry! Even got a red face from the sun yesterday enjoying an hour in the pool with my kids (not our pool. we're not that rich!). We have been out lunching around the island - a huge lunch at Laem Hin Seafood on Thursday 6th - some photos on the Jamie's Phuket Facebook Page. Yesterday also nice and sunny for a lunch at Cape Phromthep restaurant which we had never tried before. Great views and we'll be back.. it will be "blogged" sometime soon. 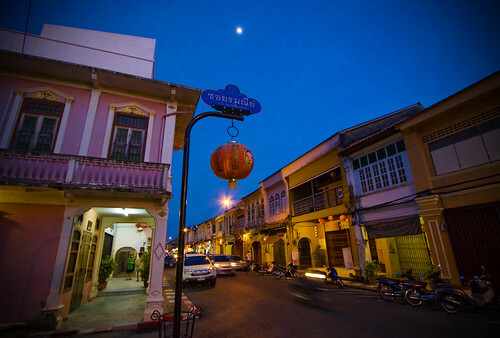 In the evening I took Mum and Dad for a stroll in Phuket Town, along Thalang Road. I want to go again and get more evening photos, it's a very nice place for a walk. Today (8th) - bloody raining again! But not too much and we're heading out to lunch soon. Can't stop the rain, and the rain can't stop us! !